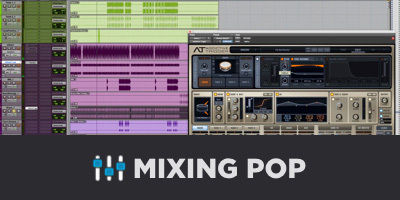 Mixing vocals to pre-mixed instrumental is an issue that just about every engineer will encounter. 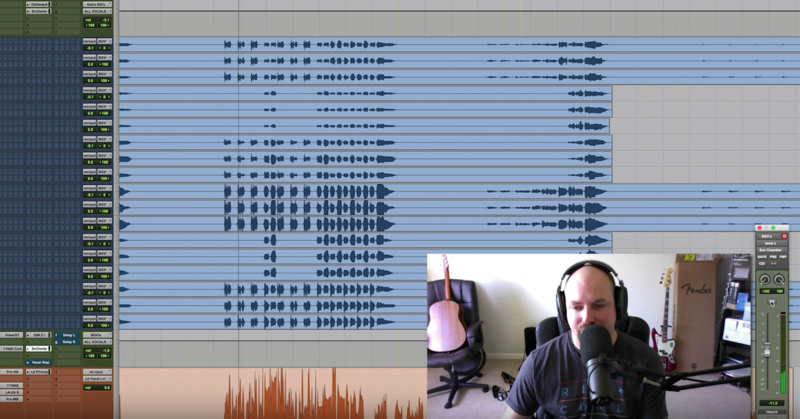 The idea of recording vocals to a mixed down instrumental has been around for decades. On rare occasion that vocal and instrumental would be released as the actual song. In Hip Hop, this is fairly common, and comes with the intention of the combined vocal and instrumental being the final release. Because Hip Hop producers mix their tracks with this intention, there’s a unique set of skills that comes into play for throwing vocals into the mix. A pre-mixed instrumental is probably somewhat compressed (or, sometimes highly compressed). It’s been “maximized” to play loudly. The challenge here is that loudness isn’t as simple as turning the level up. After a certain point, loudness can only be achieved by increasing the density of the record, rather than the volume. The issue is that if the track is exceedingly dense, there is no room for the vocal. In fact, the first thing one has to do is turn the instrumental down in volume significantly in order to make anything work. By this token – the louder the instrumental – the quieter the end mix. Ironic, no? We need to approach this mix with the forethought of compensating for whatever quality the instrumental is coming in as – highly compressed, mp3, possibly in mono, the list goes on. But first thing’s first. Get the vocals sounding the best you can on their own. There are some great tutorials for this right here on the site. I’d start with Mixing Rap Vocals Part 1. Since the information on vocal treatment is covered elsewhere, I’m going to focus on working the vocals with the instrumental, and treating the instrumental. Match the vocal to the instrumental. And we need to do this as non-destructively as possible. To open up the instrumental, try to do as little EQ as possible. 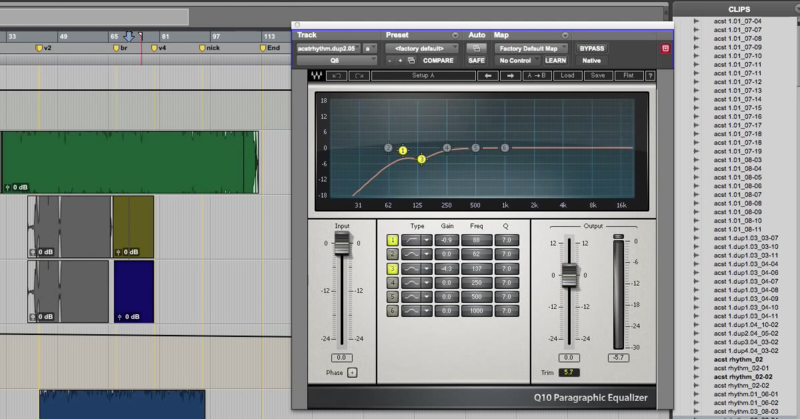 EQ is the method most people seem to recommend, but EQ is used to correct tonality issues. If the instrumental is too dense, that’s really more of a dynamics issue. Turn the instrumental down, and use an expander or transient designer to rebuild the peaks of the drums. It can take a while to get used to using an expander. 3 to 6db of dynamic range adjustment is usually a good start. If the record is clipped, you may need to use something like iZotope RX to get your peaks back. Sometimes an instrumental is so compressed, there’s no transient at all for an expander/transient designer to grab. In this case, you may need to get inventive. Often times, I’ll find drums that match or compliment the drums in the record. I’ll lay my own drums into the track. If you can’t make it, fake it. Another place you can get a little dynamic is in the “side” information. M-S processing can allow you to separate the sound that lives in the center from the sound that lives on the sides. Pulling the center down but keeping the sides up a bit can help in creating a sense of dynamics, and a “pocket” for the vocal to live in. If there’s anything that really steps on the vocals, notch it out a hair. Subtlety is the goal here. It’s impossible not to make compromises when you are EQ’ing the entire instrumental. Once the vocal is in a good place on it’s own, there comes the game of “matching” it to the instrumental. The idea is to make the vocal sound like it belongs with the instrumental. For example, the instrumental may be highly compressed, and your vocal may be very dynamic. The result here is that the vocal will always either sound like it is buried by the instrumental, or so loud that it feels like it’s hanging over the mix. Neither of these are great, but if I were to err, I’d lean toward the side of the vocal being over the mix. You can minimize this effect by compressing the vocal until it starts to compete with the density of the instrumental. This takes a lot of tact, and often requires a number of compressors working in tandem in order to reduce the negative artifacts of over compressing a voice. If you are careful in your approach you can get the vocals pretty darn compressed without them sounding “bad”. But it’s a negotiation. The instrumental may be very bright or very dark. You may want to lean your vocal EQ to compliment this. A bright vocal on a dark track will sound a little unglued. This goes for the rest of the frequency spectrum, and overall tonal qualities like distortion. If the track has a distorted or saturated quality to it, you may want to purposefully distort the vocals. Obviously don’t do it if it’s too detrimental, but it’s something to consider. Lastly, match the space. If you have a mid-side processor, solo the side signal, or turn the center signal way down. 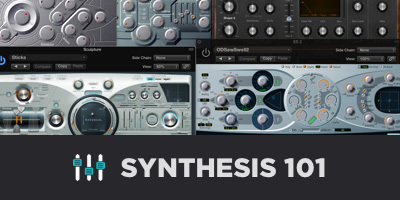 This will expose the quality of the reverbs used in the instrumental. Finding a similar reverb/delay, and EQ’ing the reverb to match the tonality of ambience in the instrumental will help bond the vocal and instrumental in the most transparent way. This takes a while to get a feel for, and is somewhat subject, but it’s highly effective. So those are my tips on mixing vocals to an instrumental track. Hopefully that helps, and feel free to leave questions or your own tips in the comment section below!